For planning purposes, early retirement age is defined as any age prior to 65. You become eligible for Medicare benefits at age 65, so if you retire prior to this age, you will need to make plans to secure adequate health insurance coverage in the meantime. This task is more easily accomplished now by accessing plans through the health exchange marketplace as you are guaranteed coverage and cannot be denied due to pre-existing conditions, nor can you be charged more if you have prior medical conditions. Retiring at 55 or younger is most common for people who began military or civil service (such as firemen and policemen) at an early age, and can thus retire with a full pension and health benefits even though they are not yet 65. As a matter of fact, a special provision in the IRS rules on retirement plans allows certain civil service employees to access retirement funds penalty-free as early as age 50. If you don't have access to those kinds of benefits, retiring at 55 takes a lot more savings and planning. 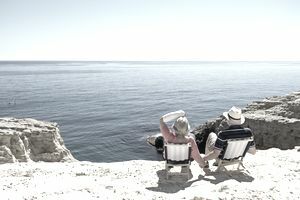 The primary challenge in choosing an early retirement age is making sure you have enough assets to provide an acceptable level of income for your future. Someone who retires at 55 may need their savings to last 35 to 45 years in retirement. If you work to 70, your savings will need to provide for a shorter time frame. You can use various retirement income calculators to help you create a projection, or you can use the services of a qualified financial advisor, ideally a person who specializes in retirement income planning. The Social Security Administration defines early retirement age as age 62. If you begin taking Social Security benefits at age 62, you will receive a reduced benefit. Many people do not realize that even if you choose an early retirement age, you do not have to begin Social Security benefits early. You may be able to maximize your lifetime Social Security by delaying your benefits until full retirement age, or age 70 when you’ll get substantially more. To employ this strategy, you would use your own assets for income in the meantime. Contrary to what most people believe, planning in this way can often get you substantially more lifetime income than taking benefits early. There are many online Social Security calculators you can use to you determine the best age to begin your benefits. One retirement planning tool frequently utilized is a 401(k) plan which has a provision allowing you to access funds as early as age 55 without paying an early withdrawal penalty tax. This only works if you leave your employer after you have reached the age of 55. There are criteria you must meet for this to work. If you don't meet the criteria, then you will need to wait until age 59 1/2 to take funds out of a 401(k), or if you do take them out earlier than that, you'll pay a penalty tax. Unless you receive an inheritance, win the lottery or have some other kind of windfall, for most folks the best way to retire early is to start planning ahead. You'll need to save a lot, find ways to live on less - or, even better, do a bit of both.